To a Special Friend Necklace. Lead Safe Pewter Charm. 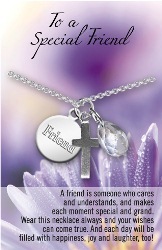 Comes with the following poem: "A friend is someone who cares and understands And makes each moment special and grand. Wear this necklace always and your wishes can come true. And each day will be filled with happiness, joy and laughter, too!"